I'm really behind with reviews at the moment, due to being quite busy, so I thought I'd just do a quick post about the three books I've read since the start of the month. This is book 3 in the author's Lady Trent series.It's a kind of alernate reality, Victorian, type setting wherein women are not supposed to have an intelligent interest in dragons or anything else really. 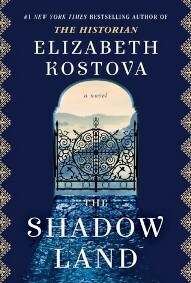 In fact, the books are as much about Isabella's struggles against the restrictions on women as they are about dragons. In this one she goes off to an archipeligo on a ship called The Basilisk to look for dragons, accompanied by her young son and the usual suspects. 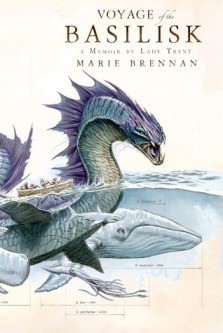 All kinds of adventures ensue and I really enjoyed the sea-voyage, 'try to blend in with the natives', travelogue-ish, theme to this story. If you're looking for books about dragons where they feature a lot, this series is probably not for you, try Anne McCaffrey, Naomi Novik, Robin Hobb. But if you're a fan of Victorian female travel writing and think you might like a touch of fantasy thrown in, you could do worse than this series. At the very least the covers are just gorgeous. 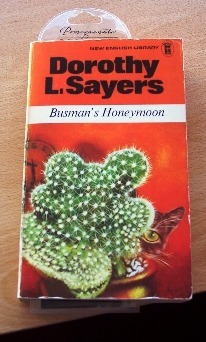 This book is a one-off - the first I've come across where you have two books, not one, in one complete story. Editor, Susan Ryeland, is given a manuscript to read, the latest by her publisher's star writer, Alan Conway. He writes a crime series about a German detective, Atticus Pund, who lives in England. Susan reads the latest instalment but finds, to her horror, that the last chapter of the manuscript is missing. Where is it? And more to the point, whodunnit? 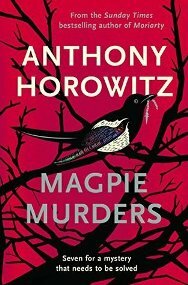 I'm a bit worried about spoilers here so I'm not going to say any more but seasoned crime fic readers will guess that there will be deaths and all kinds of Rum Goings On, and it's all very engrossing. And almost as soon as the book begins the reader has the manuscript of the new book to read... when that finishes Susan's investigations begin, so really it is two books in one. I won't pretend I didn't get confused, because I did. I occasionally had to stop and remember which characters belonged in which book, which were fictional and which... well... they're all fictional so you can see where the confusion comes in. It's beautifully written by the creator of the wonderful TV series, Foyle's War, very clever and enjoyable. 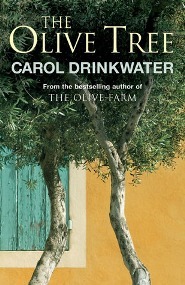 Lastly, a non-fiction, The Olive Tree by Carol Drinkwater. 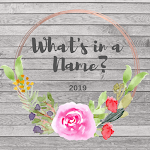 This is my third book for my What's in a Name? challenge, covering the category, 'A fruit or a veg'. In her book, The Olive Route, which I read two years ago, Carol Drinkwater went looking for the origins of the olive tree. In that book she travelled to the eastern Mediterranean, covering The Lebonan, Irael, Palestine, Libya and so on. In its successor she tours the western Med starting by touring Spain, mainly by bus. Morroco follows Spain and then Algeria, two countries where it can be difficult for western women travelling alone. In fact in Algeria it's arranged for her to be escorted by a network of bee keepers, who take her safety very seriously; despite that, it's not a country that she felt comfortable in. From there Carol is back in Europe, touring Italy. This was my favourite section and she clearly adored it too... I thoroughly enjoyed all the island hopping. I think I probably enjoyed the first book more than this, but only slightly. The olive is not as centre stage as it was in book one and I have to admit that her experiences in Morroco and Algeria took up more of the book than I would have liked. That said, Carol Drinkwater is a superb writer, lovely observations of simple things, of people, of quirky happenings and stunning landscapes. She may not think of herself as a travel writer but she surely is. It seems I last did a jigsaw puzzle post in February so it's more than time to inflict another one upon you. 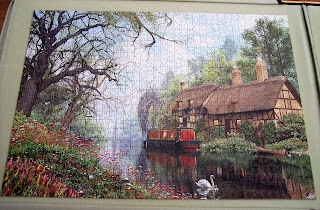 *Coughs* I've slowed down a bit this past few weeks as summer is always a bit busy with grandkids and the garden. Also I usually do them in our conservatory and it's just been too hot in there for weeks on end; the heatwave has now ended thank goodness. 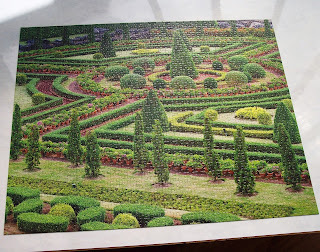 Anyhoo, a few puzzles (not all) that I've done since February. These two were charity shop buys, both unopened. They're from W.H. 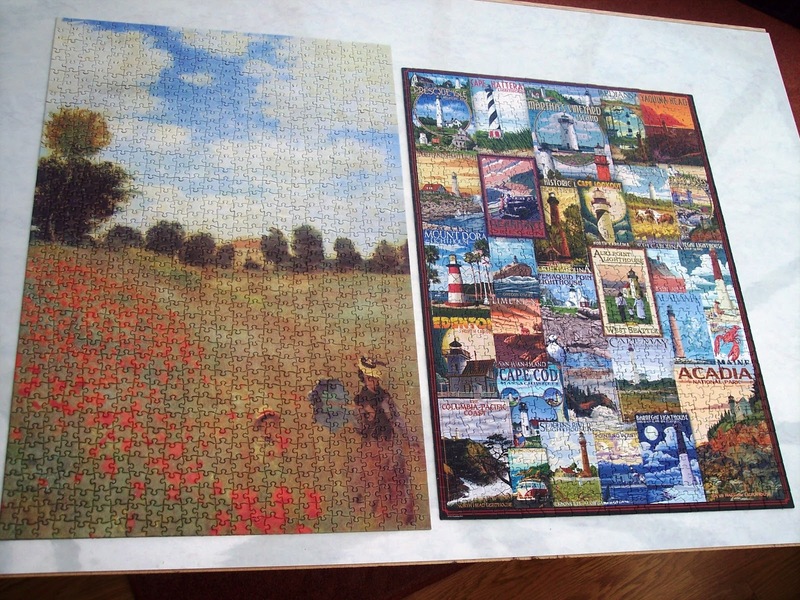 Smith and both 1000 pieces. I tend to think I'm not a cottagey person when it comes to jigsaws but I think I must be lying to myself as I love this kind of nostalgic scene. 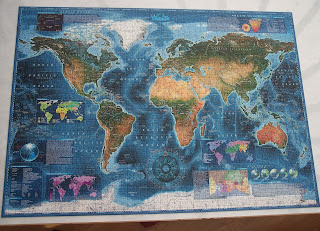 I love maps so this 2000 piece one was a joy to do. Quite tricky with all the sea but I like a challenge. 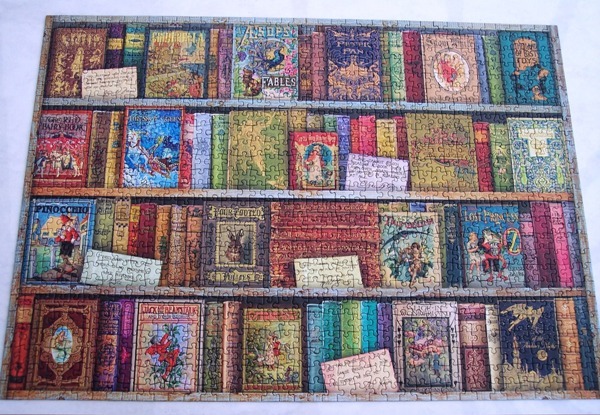 A dear friend was clearing out some puzzles and sent me a lovely surprise parcel of them (the joy!!) and this was one. I loved how difficult it was with all the rigging and the tricky sky. 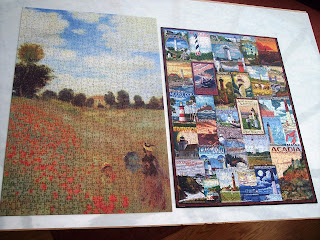 A painting by Monet which was a gift from one of my daughters (the jigsaw not the painting, sadly) and a lovely collage of American lighthouses, both 1000 pieces. Another gift from my daughter, a scene of a garden in Thailand. 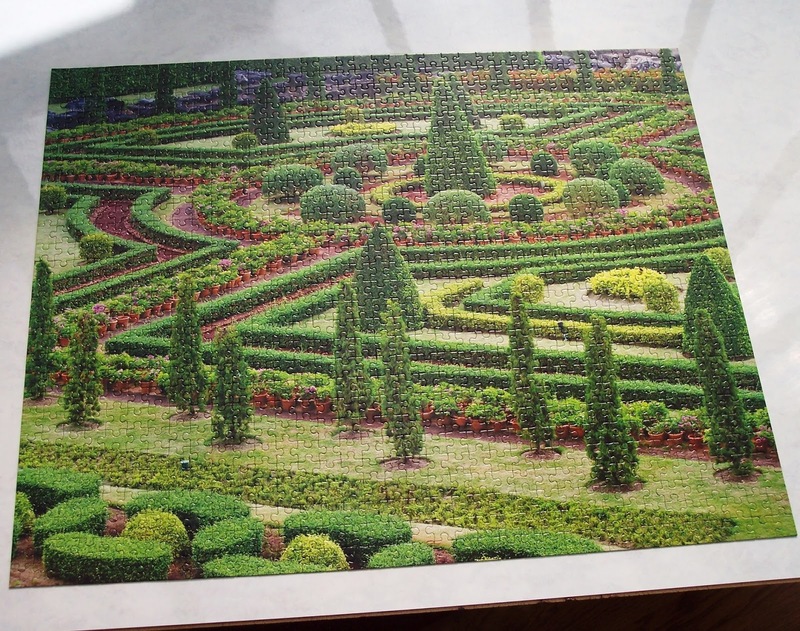 1000 pieces and quite a challenge with all those hedges that look the same. Finished this one a couple of days ago. 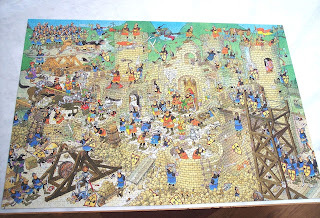 Took me three weeks which is hardly surprising looking at the cartoon picture and how much detail is in it. Loved doing it. 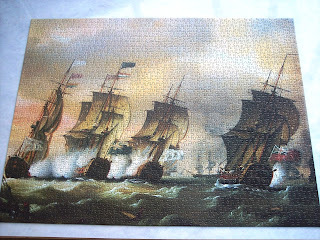 2000 pieces, art by Jan van Haasteren, puzzle by 'Jumbo'. Sometimes I wonder if I have too many indoor hobbies and ought to get out more and, although I do work in the garden a bit, this is probably the case. 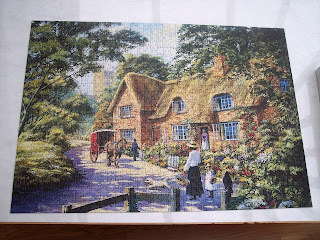 The trouble is my natural inclination is to get comfy in my favourite chair with a book, a puzzle, a computer game, or something detective-ish on the TV. I like being outdoors but I don't love it as much as I love being warm and cosy indoors with things that interest me. Something to ponder. July was a fairly average reading month for me, six books read and enjoyed. All fine and dandy. Except... I really hate the month of July. And this year it was especially bad with very little rain and high (for us) temps. The countryside is all yellow and brown from lack of water and so is our grass. Veggies struggling, we have watered a bit but you can't go mad in case there's a water shortage. Horrible. I can't wait for autumn to be honest, although thankfully we've now had a fair bit of rain and it's a bit cooler. 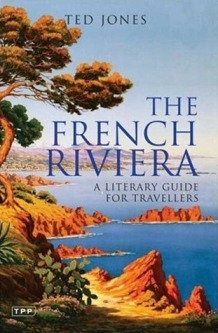 Blurb from Goodreads: The French Riviera: A Literary Guide for Travellers is a reader's journey along the fabled coast which has provided the inspiration and setting for some of the greatest literature of the nineteenth and twentieth centuries. From Hyères and St. Tropez in the west to the Italian border in the east, Ted Jones introduces the lives and work of writers who passed this way, from distinguished Nobel laureates to new authors who discovered their voices there. His encyclopaedic work covers them all: writers such as Graham Greene and W. Somerset Maugham, who spent much of their lives there; F. Scott Fitzgerald and Guy de Maupassant, whose work it dominates; and the countless writers who simply lingered there, including Louisa M. Alcott, Albert Camus, Bruce Chatwin, T. S. Eliot, Ian Fleming, Sylvia Plath, Jean-Paul Sartre, Leo Tolstoy, Evelyn Waugh, Oscar Wilde - and countless others. That sums it up much better than I ever could. I enjoyed this journey along the coast of the French Riviera, reading about individual writers and their connections to certain towns. 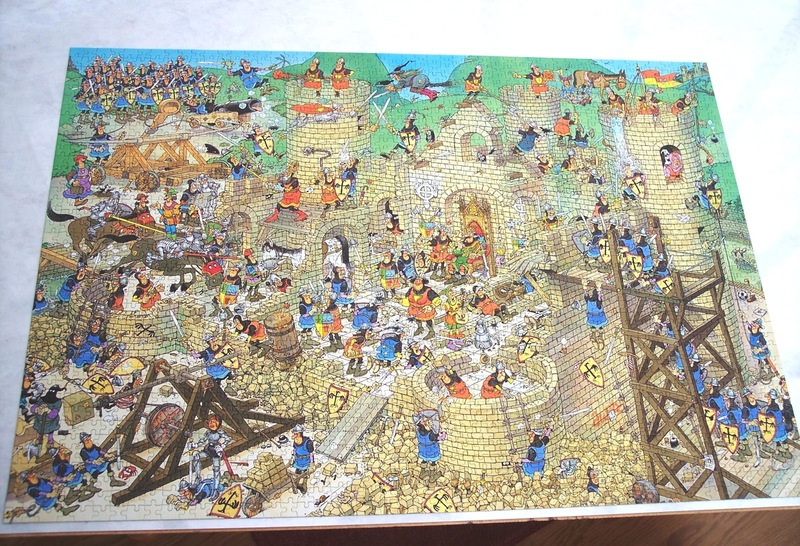 Perhaps it wasn't quite a as rivietting as I was hoping it might be, but there you go. I read it at the same time as Death on the Riviera by John Bude so I could see that the observations he made about the British expats there were spot on. I have The Riviera Set by Mary Lovell to read so that should increase my knowledge a bit more. 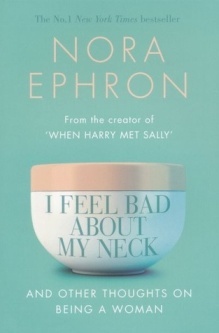 I'd heard of Nora Ephron but wasn't quite sure who she was. Apparently, she's a screenwriter and film director of films such as Sleepless in Seattle, You've Got Mail and When Harry Met Sally. She's also a fine essayist. I really enjoyed this books of her essays, covering all kinds of subjects but especially female experiences, marriage (I think she's been married several times), and life in New York. If I'm honest I liked her writings about New York more than those about the female body. I'm not really into make-up, trying to look younger and glamorous and so on but I was fascinated to hear about the famous appartment block she lived in, what happened, and other tales of New York. I think I don't read enough of this type of book, *note to self* search out more. Because, when all's said and done, who doesn't love a bit of Lord Peter Wimsey and Harriet Vane? So, that was July and now it's August and hurray for that as I can see Autumn at the end of the tunnel! Let joy be unconfined.